Schmidt Family Mission: "Daughter, your faith has saved you; go in peace." "Daughter, your faith has saved you; go in peace." When Taylor was introduced to Isabel he was told that she was very sick. Taylor and Max went to her house to visit with her. They found her sitting in a chair in pain. The picture above shows the cause of her pain. Her friends tried their best to console her by placing cool rags on her foot as well as moving the air around her foot to keep the flies away. There was no medicine to treat her foot in her pueblo. They believed it was a flesh eating disease and that she needed to somehow get to Tarapoto for treatment. No trucks were scheduled out since the rainy season was about to begin and she was in no condition to walk. Taylor and Max prayed with her. They shared the gospel. Taylor said that they only thing he could give her was his prayer but that is all that God needs to work with. Simply put faith. Taylor shared the miraculous healings from the Bible. He also shared our own stories of miraculous healings. Taylor then prayed over her that she might have faith and that God would show mercy and heal her. When Taylor explained her condition to me when he got home I contacted a friend in regards to her condition. The news was not good news. Upon reviewing the picture they came to the conclusion that she had a flesh eating disease and that she needed immediate treatment with powerful IV medicines. Unfortunately the rainy season had begun. There was no way to get to her. We turned to the Lord in prayer and begged for His mercy. Last week Taylor, Max, Andrea, and Bre headed back to the Valley once again. This time they had four days to minister to the people. One of the stops along the way was to visit Isabel. We had hoped that we would find Isabel alive. Praise be to Jesus Christ. Isabel was alive. In fact Isabel was cured. She shared with the group that during those months she thought she might die but that she still had faith that God would heal her. She shared a dream she had. She said that she had gone to Heaven. And while she was there she went to the foot of our Lord. He had said that it was not her time yet and there was still work for her to do. He asked her to be a missionary, to spread His Good News. It was then that she knew she would be healed and that she was supposed to take part in sharing the Gospel. Our friend Bre, a nurse, evaluated Isabel. She found that she had complete use of her foot and complete feeling in it as well. Both of which seem impossible due to the thickness of the scar tissue. Isabel asked that the missionaries pray over her again but this time so that she might be able to walk. She hasn't left her chair in 5 years but she is determined to become God's missionary and to spread His Word. Isabel with Bre. Bre examined Isabel last weekend. 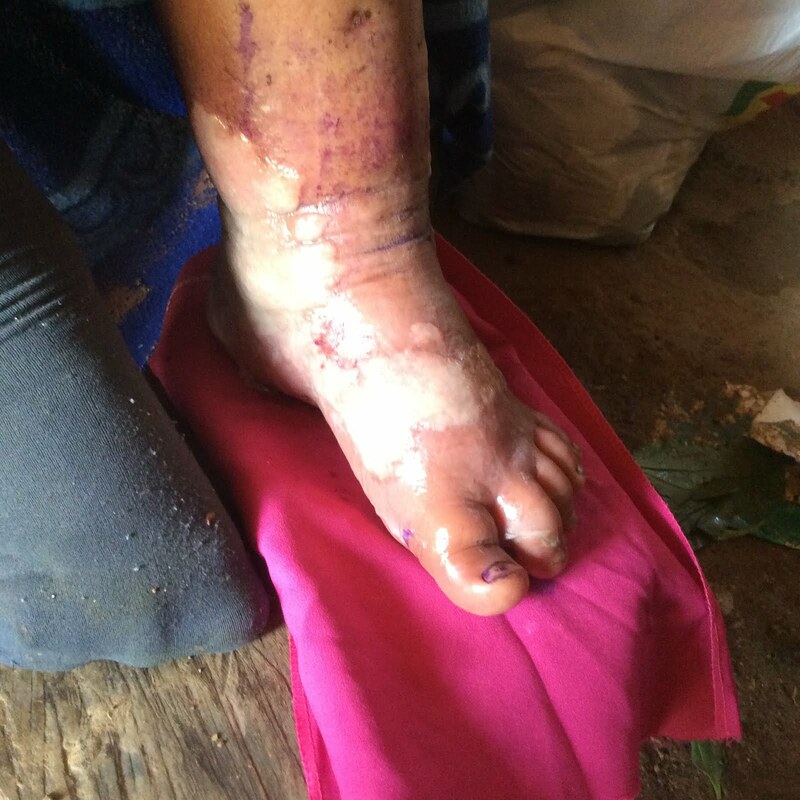 She found that Isabel's foot is completely healed with full motion and feeling. If you're at all interested in knowing . . . the Catholic Dogma . . . that we *must believe* to get to Heaven, and which you have *never* seen . . .
"For I know their thoughts, and what they are about to do this day." The group that calls itself "islam" ... is not a religion. Fully proven by the fact that the "koran" says the *opposite* of the Old Testament Prophets > Section 113 of the site. Recognition be to Jesus Christ. Isabel was alive. Indeed Isabel was cured. She imparted to the gathering that online assignment expert amid those months she thought she may pass on however that regardless she had confidence that God would mend her. I pray for her she get well soon. Your article is clearly exceptionally fascinating and instructive also. I accept such articles must be inspired more with a specific end goal to stay in contact. Not just that it likewise helped me in increasing individual information. Michelle Rodriguez Leather Jacket Instylejackets.